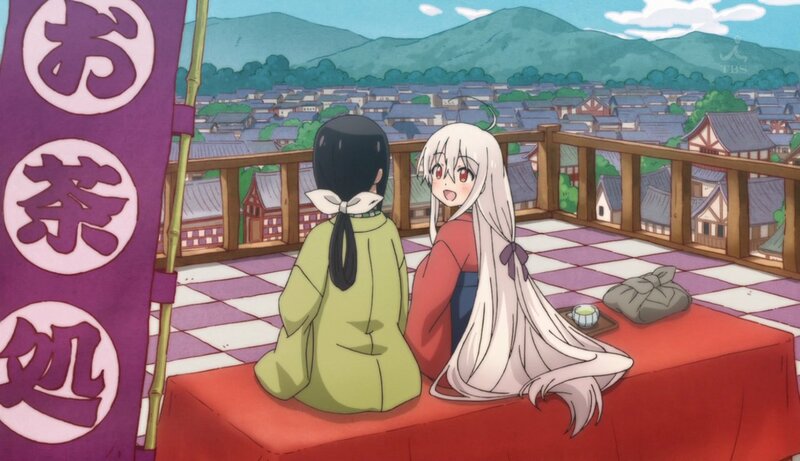 Now these were two very interesting episodes – once again the focus was primarily around Chiya and other Urara’s encounters with the element of the “other” that is intertwined with her background, history and possibly even her “fate” in a way. 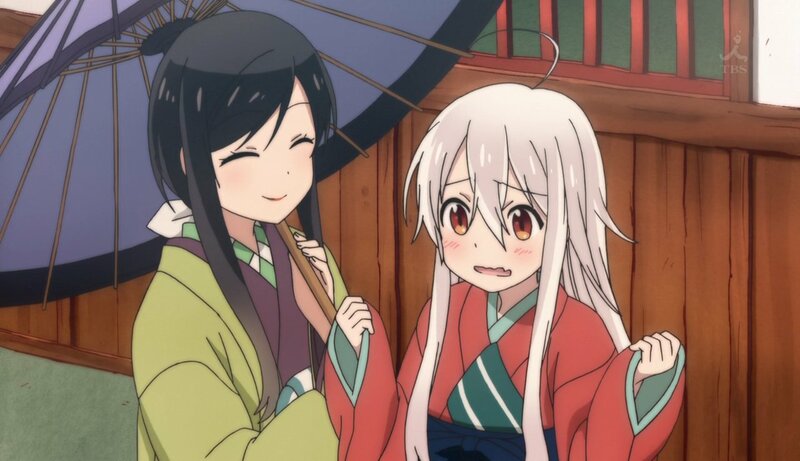 We have already had occasions of Kon having suspicions that there was something much more to Chiya than meets they eye, and not just in the sense of personality or the like … much more so in the context of an Urara proper. 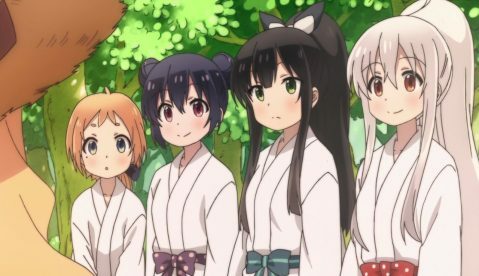 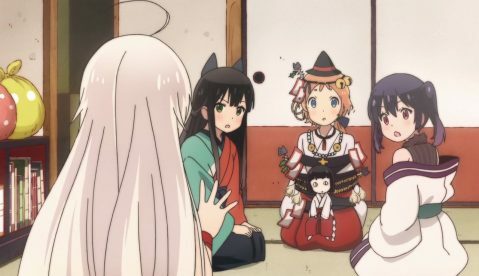 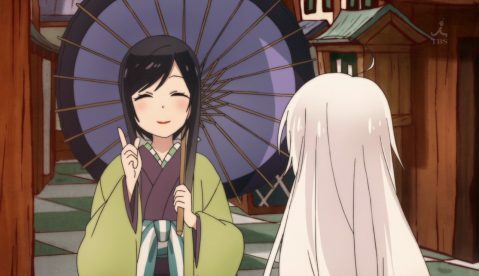 For some time now she has suspected that Chiya may be one of the “special ones”, those “set aside by the deities of Meirochou” for whatever reason. But this episode had Kon getting some first hand experience of getting a glimpse into the “realm” that Chiya has not only already glimpsed a couple of times, but even poked her head inside the door and looked around a bit. 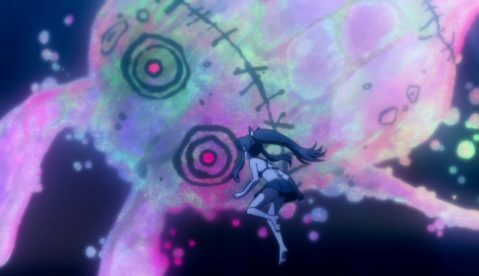 Episode 8 at first glance seemed to be this series’ version of “the beach episode”; that is, where the characters go swimming and provide the viewers with some light fanservice and playful hijinks and interactions, etc. 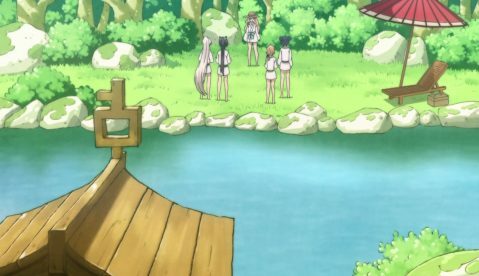 Nina knows that they all have been studying very, very hard (the incantation book memorization exercise last episode being an example of this for those who remember) and wants to give them a breather, so she takes them to a small lake in the nearby forest for a little rest and relaxation. 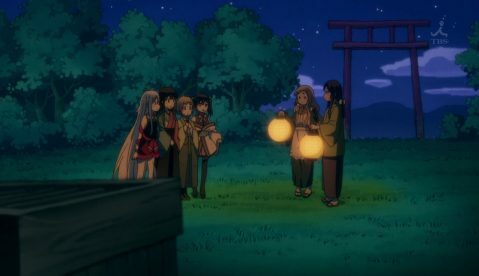 While they all are involved in their usual carrying on and such Kon mentions wanting to try out a highly discouraged divination method (I guess it is considered dangerous?) 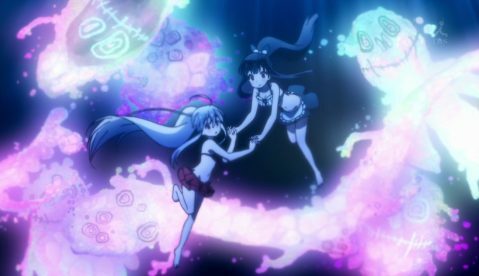 where two urara submerge themselves in water and “join their psychic perception”, thus momentarily strengthening one another and allowing them to potentially perceive things they might not be able to on their own. 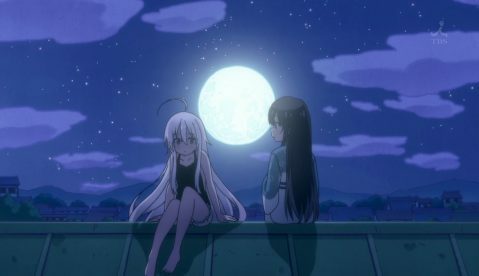 The long and the short of it is that Kon winds up trying this with Chiya and suddenly finds herself able to perceive things that she never has before – she even has an experience of one of these mysterious, large beings expressing it’s displeasure with her and chiding her (curiously in what sounds like a feminine voice) in a way that seems dangerously playful, almost like a cat teasing a mouse. 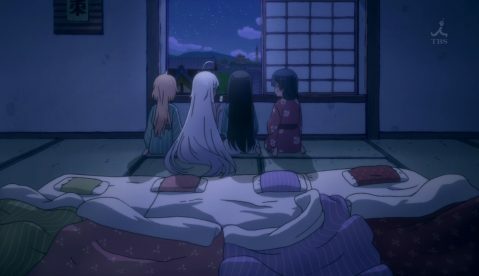 Quite understandably even though Chiya is not scared or disturbed or the like Kon gets quite scared, to the extent that she has nightmares about it afterwards. 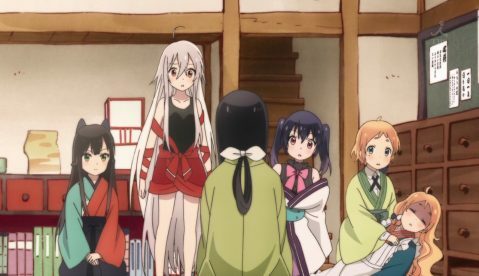 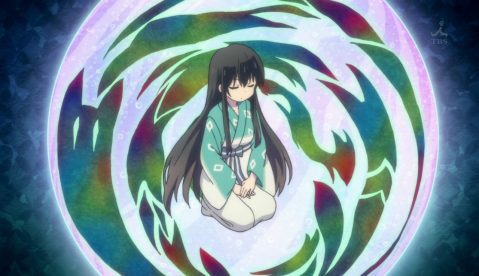 What she is most scared about, though, is the teaching her mother taught her of how those who “intrude” into the realm of Meirochou’s deities can and apparently have been punished before with having their divination abilities taken away from them. For Kon, who has striven to be an urara and follow in th footsteps of her mother for much of her life, such a thing in many ways is one of the scariest things she can imagine, it seems. Later that evening, after expressing this fear to Chiya (who responds in her usual characteristic simplicity and even fearlessness) both Koume and Nono pop up with the intention of putting these fears to rest (Koume often deals with all these things in a very practical way) and bringing a kokkuri mat to do a hands on test of whether or no Kon has had her abilities stripped from her. Happily for Kon the fox spirit she calls on answers her very quickly and happily puts her fears to rest. While this is good for Kon, perhaps what was most instructive for her (and the viewers?) was the contrast between how Chiya’s defaults with regards to everything around her are different than others – in some ways she is so “herself” that she remains so not matter who or what she encounters and treats others in a fair and even handed way, never “losing sight or track” of who she is. In some ways she lives in the same world as the other urara and is plenty “human”, but at the same time her world is just different enough…. 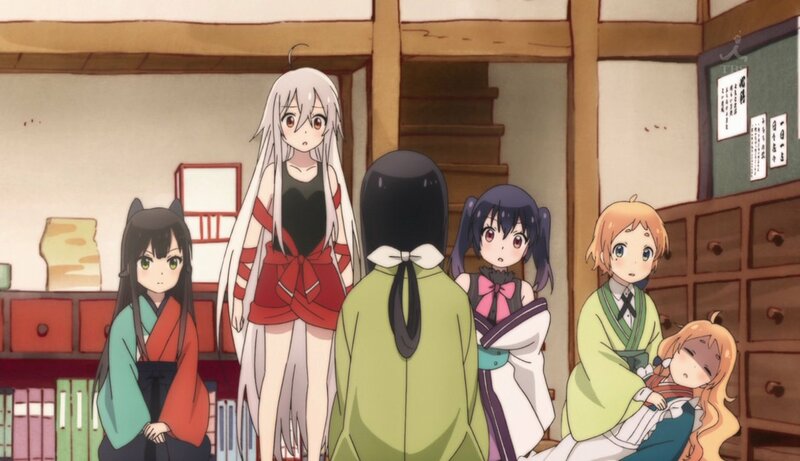 Episode 9 has similar content as episode 8, but from a different angle and different people – this time people much more experienced on the “urara totem pole” as well, which once again makes things much more interesting considering the angle of approach. 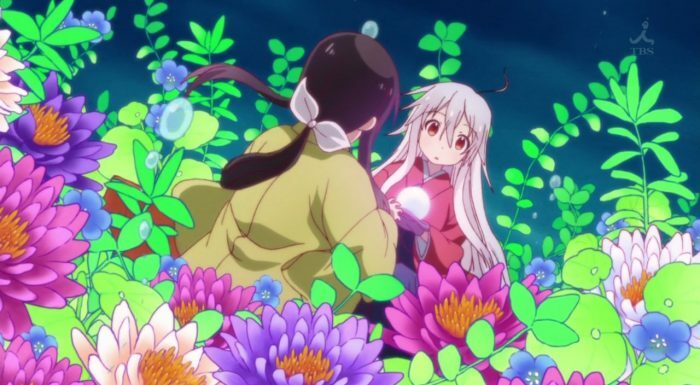 This time the person in question who gets a glimpse into Chiya’s inner world unexpectedly turns out to be Kon’s mother (?! ), whose name is Tokie. 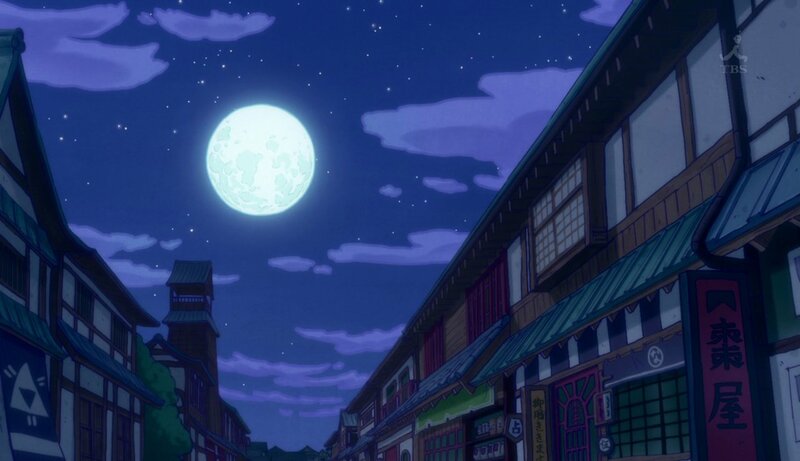 She is a rank 2 urara (whoa) and comes across Chiya while the latter is searching for her mother by running across the rooftops of the “rank 10” part of the city. In many ways it was heartbreaking to hear Chiya describing how sometimes she simply cannot bear sitting still in her longing to meet up with her mother, and just “runs blindly” in her searching to “do something”, even anything, even though she knows how unlikely such activity is to bear the desired results. Tokie, VA’d wonderfully by Mamiko Noto, immediately takes to Chiya (the motherly instinct kicks in, it seems) and since she was heading to the Natsume-ya teahouse that day anyway offers to guide Chiya back home as well. 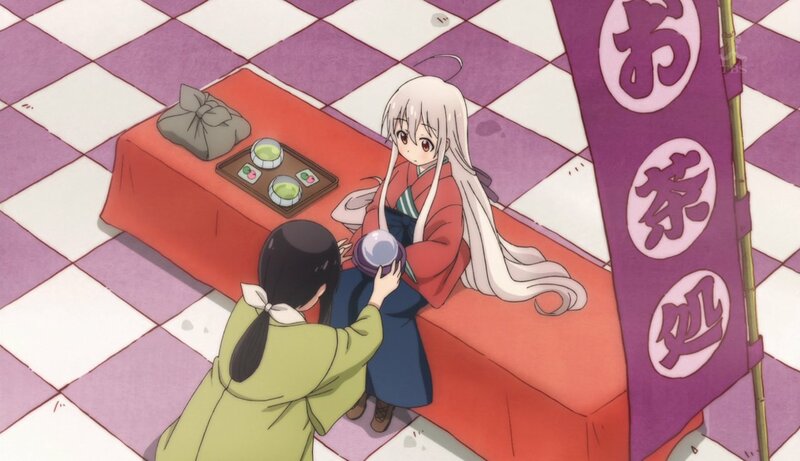 The gentle and caring interaction between Tokie and Chiya is quite touching to see, and while en route Tokie offers to use her crystal ball to help Chiya out and make a divination for her. 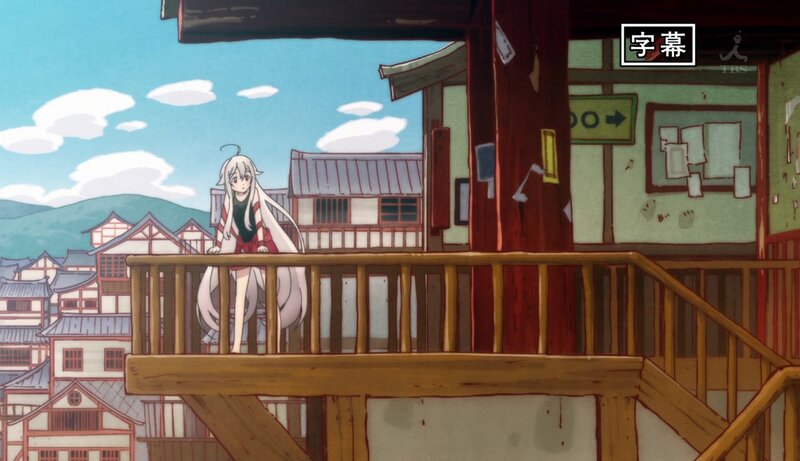 The scene of the two of them in the midst of it all is very well done by J.C. Staff as usual, and it is interesting to see how much a rank 2 urara can perceive. 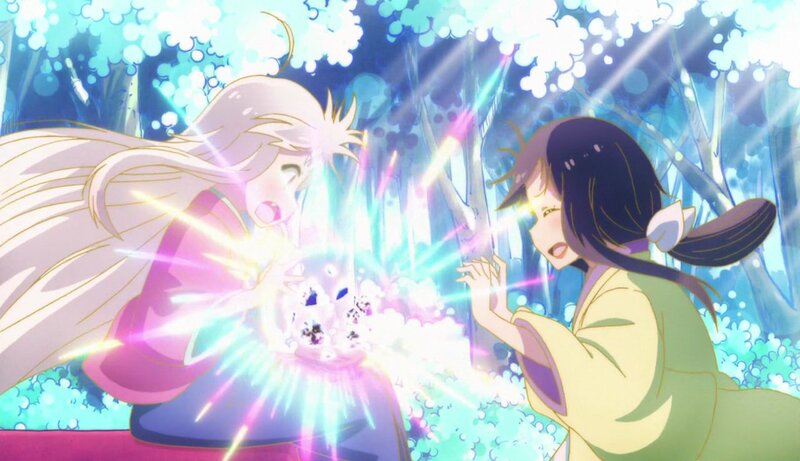 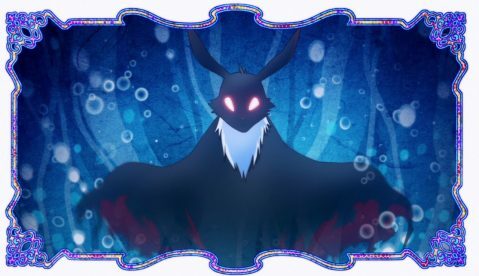 But what is not expected is that suddenly Tokie’s crystal ball becomes clouded over with a dark cloud, and for a split second she catches a glimpse of a strange being with glowing eyes and “surrounded with a dark miasma like a curse” when suddenly the ball literally explodes into shards on Chiya’s lap! 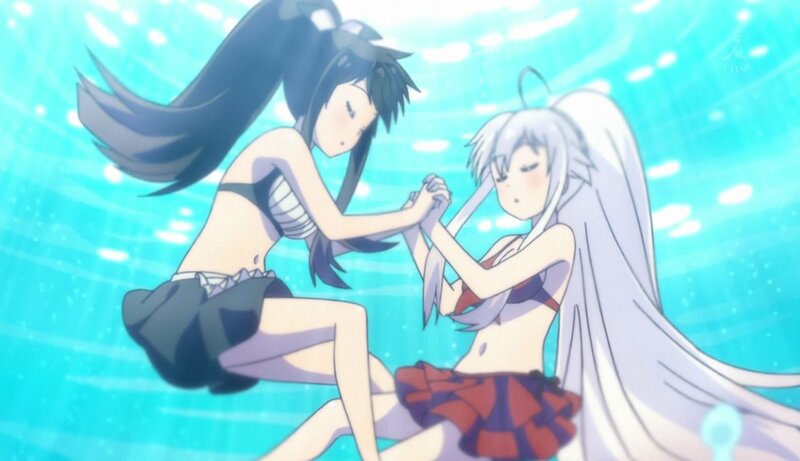 Fortunately it seems neither of them was hurt by it. 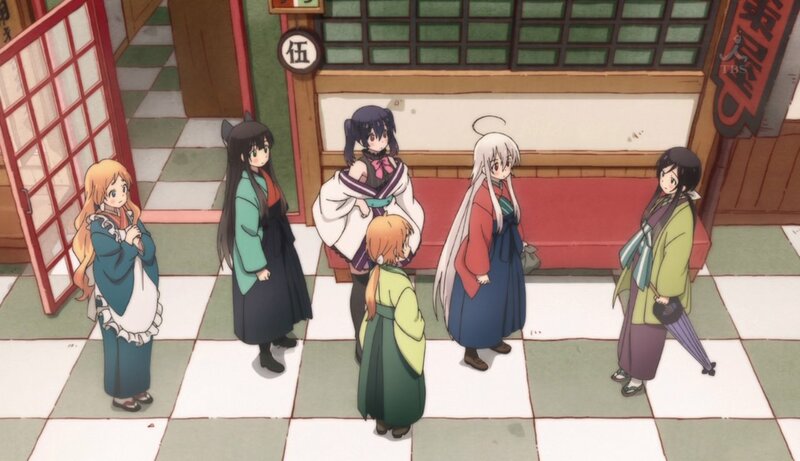 Still, here again we see another angle into the mysterious world Chiya seems to have one foot in and one foot out of, but seen through the eyes of a high ranking diviner and laced with rather … sobering results. 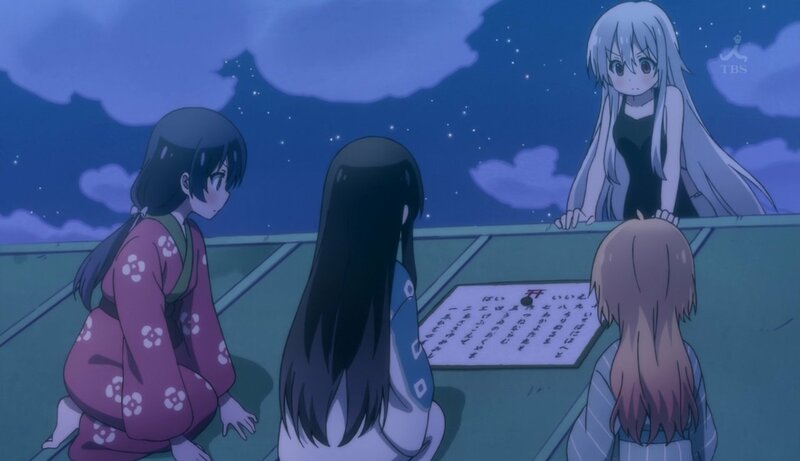 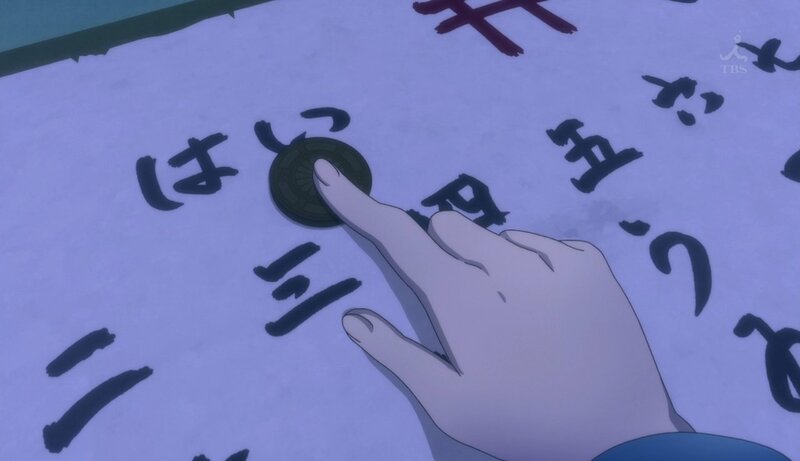 It turns out (to make a long story short) that Tokie was on her way to Natsume-ya to secretly give the girls a test to evaluate whether or no they were ready to be candidates for taking the test to try and become rank 9 urara. And the test itself was interesting and made sense – it was presented in the context to get a glimpse into the moral fiber of the young ladies based on how they would respond when confronted with one of their number being endangered. 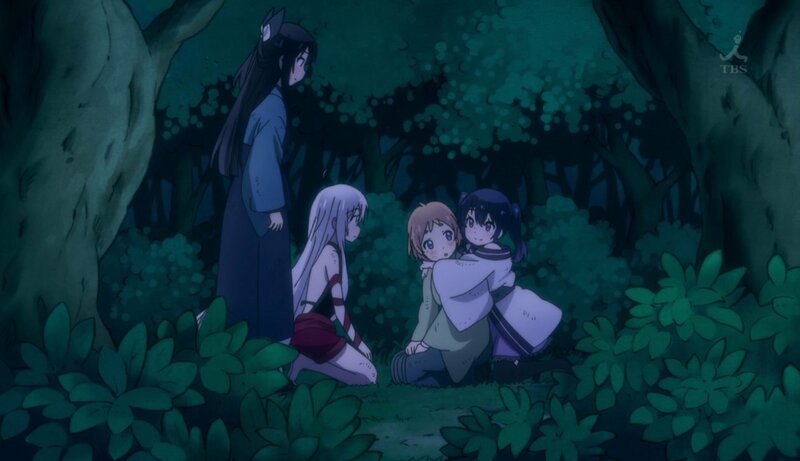 Of course Nina was in the know the entire time (her acting skills were horrible by the way, and definitely made me chuckle), but all four of her apprentices passed with flying colors.